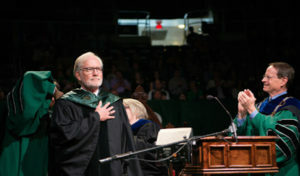 Ohio University alum David Crane, who earned a bachelor’s degree in History in 1972 and a master’s in African Studies in 1973, was presented an Honorary Doctorate of Letters Degree at the Graduate Commencement on April 28. He earned a J.D. from Syracuse University in 1980 and is now one of the world’s international law experts. Crane has held many positions during his 30-year career with the U.S. federal government. Some of them include: judge advocate for the U.S. Army, assistant general counsel of the Defense Intelligence Agency and founding director of the Office of the Intelligence Review in the Department of Defense. He also has served as the Waldemar A. Solf Professor of International Law and chairman of the International Law Department in the U.S. Army Judge Advocate General’s School. Among his duties were prosecuting cases, educating attorneys on international humanitarian law and overseeing investigations into acts of terrorism and international aggression. After retiring, he was appointed by United Nations Secretary General Kofi Annan as the founding chief prosecutor of the Special Court for Sierra Leone. He was responsible for evaluating and prosecuting individuals who committed crimes against humanity and violations of international human rights that occurred during the Sierra Leone civil war, 1991-2002. He is the founder and vice president of the “I am Syria” campaign, which educates the world on the Syrian Conflict. He also founded “Impunity Watch,” a law review journal and news reporting site that caters to government officials, non-governmental organizations and international lawyers.